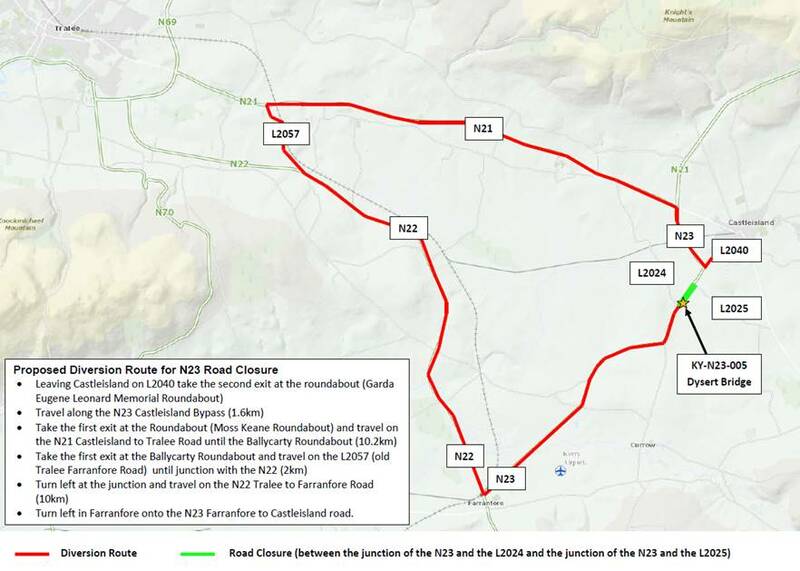 A section of the N23 road between Farranfore and Castleisland will be closed to traffic from Thursday next, 24 May to facilitate the demolition and rebuilding of Dysert Bridge on the N23 national primary route. The road closure is being put in place for safety reasons and to allow for major construction work on site. The section of road which will be closed is located between the junction of the N23 and the L2024 (Camp Road) and the junction of the N23 and the L2025 (Powell’s Road). The closure will be in place from 7.00am on Thursday, 24th May to 6.00pm on Monday, 20th August, both dates inclusive. The purpose of the road closure is to facilitate the demolition and replacement of Dysert Bridge which is very narrow, is in poor condition, and which has been the location of a number of accidents over the years. The demolition of a bridge and its replacement on a national route such as the N23 is a major construction project and requires the complete closure of the route as a result. This will inevitably cause disruption for members of the public and motorists but for reasons of safety, it is necessary. There will also be minor realignment of the N23 Castleisland to Farranfore Road at either side of Dysert Bridge as part of the works. Kerry County Council appreciates the cooperation and patience of motorists while this essential work is being carried out. The main diversion route is via the John Cronin Roundabout at Ballycarty on the N21 (Tralee-Castleisland road). Motorists travelling from Limerick/Castleisland to Kerry Airport as well as commuters travelling to and from Killarney should allow extra time for the journeys.